Pressing Pause: 100 Quiet Moments for Moms to Meet with Jesus is a devotional filled with inspiration for moms. Pressing Pause will inspire and encourage you in each daily devotion which shares a story or experience from the authors that moms can relate to and will help you to be a better mom. Note: I would like to thank Booklook Bloggers for providing me a copy of this book for review. All opinions here are my own. This post includes affiliate links. Read my disclosure policy here. Pressing Pause was co-written by Ruth Schwenk and Karen Ehman. Ruth and Karen alternate writing each chapter. They both share highly relatable stories from their personal experiences as a mom and show how we can be more Christlike even in our simple everyday tasks. One of my favorite chapters in the book was, “We Have To or We Get To?” by Karen. 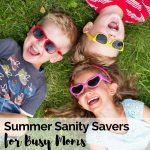 She writes about doing her long lists of to-do’s including all her housework like mopping, paperwork, vacuuming and more that moms me. Sometimes we feel like “poor me”. Karen suggested we should change our perspective and attitude. Instead of feeling like we “have to” do all these chores, we should think we “get” to do all these wonderful things because of God’s blessing in our life. In another chapter, Ruth wrote about parenting, not just our children, but all of our children’s friends as a “spiritual” parent. She is right. We have an opportunity to show Christ’s love to all the children who come into our home, not just our own. This chapter really spoke to me about how I need to be more Christlike for my children and for their friends. These are just 2 examples of the many insights you find in Pressing Pause. We are all busy moms. Each chapter is written that so you can read it in about 5-10 minutes. Perfect reading for busy mornings, during your lunch break at work or while you are waiting in the school pick-up line. The only thing I would have added to this book would be at the end of each chapter additional reading passages for your daily devotion time. I highly recommend Pressing Pause for moms. If you need encouragement or inspiration on how you can be a better mom, this book is perfect for you. What is your favorite devotional book for moms? Why do like it?